A new generation of full-size flagship tablets has just started with the near simultaneous launch of the Apple iPad Air and Amazon Kindle Fire HDX 8.9. They both have top-of-the-line and state-of-the-art displays that have been significantly improved (in different ways) from the 2012 models. Here's which one's the best. The Google Nexus 10 is another innovative flagship tablet that launched at the beginning of November 2012, so it’s now a bit overdue for an annual makeover, which is rumored to be happening sometime during November 2013. We’ve included it here even though it’s at the end of it’s product cycle because it has been a leader in this class, and will illustrate the changes in tablet displays that have taken place in just the last year. When the new 2013 Nexus 10 launches we will update this flagship shoot-Out. These are all full size tablets that have 9- to 10-inch displays, each with 3- to 4-megapixels, and around 300 pixels per inch (PPI). At normal viewing distances a person with 20/20 vision can’t resolve the individual pixels, so the displays will appear to be perfectly sharp. 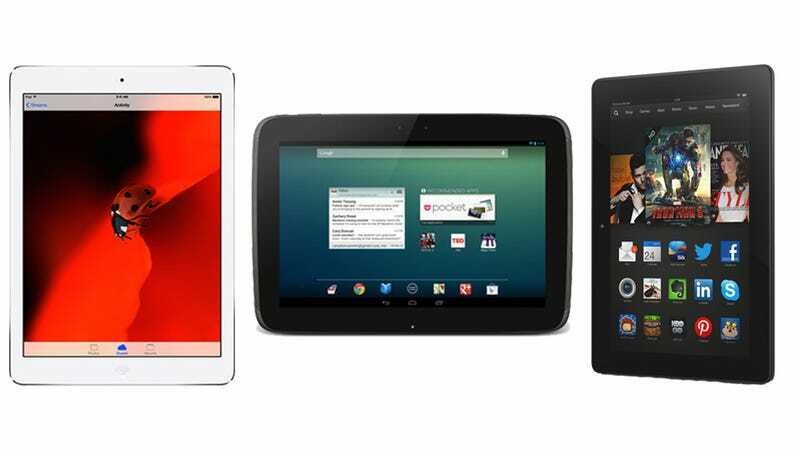 2012 was the year of high PPI Tablets, with Apple bringing its “Retina Display” to the iPad, and Google later introducing its even higher 4-megapixel Nexus 10. 1) Picture quality as good or better than your HDTV. Amazon provided DisplayMate Technologies with a pre-release production unit of the Kindle Fire HDX 8.9 to test and analyze for this Display Technology Shoot-Out article. To examine the display performance of the Amazon Kindle Fire HDX 8.9, the Apple iPad Air, and Google Nexus 10 we ran our in-depth series of Mobile Display Technology Shoot-Out Lab tests. We take display quality very seriously and provide in-depth objective analysis side-by-side comparisons based on detailed laboratory measurements and extensive viewing tests with both test patterns and test images. To see how far mobile displays have progressed in just three years see our 2010 Smartphone Display Shoot-Out and 2011 Tablet Display Shoot-Out, and for a real history lesson see our original 2006 Smartphone Display Shoot-Out. The Kindle Fire HDX 8.9 is Amazon’s 3rd generation LCD tablet, and their displays have been improving by leaps and bounds since we first tested them back in 2011. The new Kindle Fire HDX 8.9 has now jumped into the impressive category as the best performing tablet display we have ever tested. It has very high brightness, very low reflectance, excellent high ambient light performance, and excellent factory calibration with the best Absolute Color Accuracy and accurate image contrast. More on these topics below. The most important and impressive under the hood improvement is the use of the highest performance LCDs with low temperature poly silicon LTPS, the same technology used in the iPhone 4 and 5, but on the Kindle with more than 5 times the screen area – the largest LTPS on a mobile display. The backlight has White LEDs, and the LTPS display has 30 percent higher power efficiency than the IGZO display in the iPad Air. More on these issues below. The iPad Air has mostly incremental but still significant improvements over the excellent 3rd and 4th generation iPad displays. Compared to the 4th generation, the screen reflectance decreased by 23 percent, the peak brightness increased by 7 percent, and the contrast rating for high ambient light increased by 32 percent – all good. Absolute color accuracy and image contrast fidelity are very good (but somewhat below the Kindle Fire) and are discussed in detail below. The emphasis for the iPad Air is in reduced size, thickness, and weight. The most important under the hood display improvement is the switch from a-Si amorphous Silicon LCDs up to a much higher performance IGZO LCD backplane, which was discussed in our iPad 3 Display Shoot-Out article last year. The switch to IGZO produces an impressive 57 percent improvement in display power efficiency from previous Retina Display iPads—so the iPad Air doesn’t get uncomfortably warm like the earlier iPads. More on these issues below. Although now close to the end of its product cycle, the Google Nexus 10 is a very innovative tablet introduced in November 2012. It was the first mainstream tablet to deliver an impressive 2560x1600 display resolution, the highest at the time. But its Color Gamut was on the small side, comparable to the older iPad 2, iPad mini, Microsoft Surface RT, and many other tablets up to that time. As the result it has never been a good choice when color accuracy is important. And like the Nexus 7 (2012 and 2013) it has a non-standard Intensity Scale that reduces precious image contrast and introduces additional color errors in the display. Hopefully, Google has been reading these Shoot-Outs and the 2013 Nexus 10 will correct this. More on these issues below. When the new 2013 Nexus 10 launches we will update this article. As expected, all of the displays were incredibly and impressively razor sharp, especially noticeable with text and graphics. The iPad Air actually has the lowest pixel resolution and PPI of these flagship tablets, but that is perfectly fine for all normal applications and normal viewing because Apple’s Retina Displays have PPIs high enough so that the pixels are not resolved with 20/20 Vision. Note that standard FHD 1920x1080 content will not appear sharper when upscaled to higher screen resolutions, and will instead actually degrade slightly due to the digital rescaling. All of these flagship tablets have fairly bright displays, with the Kindle Fire HDX 8.9 the brightest full size tablet that we have measured so far in this Shoot-Out series, with an impressive peak brightness of 527 cd/m2 (sometimes called nits). Part of this is due to its high performance and high efficiency LTPS LCD display discussed above. The iPad Air has a very Good 449 cd/m2 and the Nexus 10 has a somewhat lower but still very good 449 cd/m2. Note that it is important to appropriately adjust the display brightness in order to preserve battery power and running time, and also to reduce eye strain from too bright a display. See the Brightness and Contrast section for details. A raw LCD panel hardware first needs to be adjusted and calibrated at the factory with specialized firmware and software data that are downloaded into the device in order for the display to produce a usable image—let alone an accurate and beautiful one. This is actually a science but most manufacturers seem to treat it as if it were a modern art form, so few tablets, smartphones, and even HDTVs produce accurate high quality images. On the other hand, the Kindle Fire HDX 8.9 and iPad Air achieve their excellent picture quality and absolute accuracy through individual detailed factory calibrations of each and every display for both color and intensity scale, which we examine next. The intensity scale (sometimes called the gray scale) not only controls the contrast within all displayed images but it also controls how the red, green and blue primary colors mix to produce all of the on-screen colors. So if the intensity scale doesn't follow the standard that is used to produce virtually all consumer content then the colors and intensities will be wrong everywhere in all images. Unfortunately, many manufacturers are quite sloppy with the intensity scales on their displays. Fortunately, both Amazon and Apple have done an excellent job with the intensity scales on the Kindle Fire HDX 8.9 and iPad Air. Unfortunately, the Google Nexus 10 has a non-standard intensity scale that reduces precious image contrast and introduces additional color errors. See Figure 3 and the Colors and Intensities section for details. The color gamut is the range of colors that a display can show. In order to produce accurate on-screen colors the display must match the Standard sRGB/Rec.709 color gamut that is used to produce virtually all consumer content. Note that consumer content does not include colors outside of the standard gamut, so a display with a wider color gamut cannot show colors that aren't in the original and will only produce inaccurate exaggerated on-screen colors—so in this instance, bigger is not better. The measured color gamuts for the flagship tablets are shown in Figure 1. The Kindle Fire HDX 8.9 and iPad Air have color gamuts close to the sRGB/Rec.709 standard, in the range of 105 to 108 percent. However, the 2012 Nexus 10 has a much smaller 58 percent color gamut, which is comparable to the older iPad 2, iPad mini, and Microsoft Surface RT. Compare the color gamuts in Figure 1. Getting very accurate screen image colors is very important and also very difficult because the display and calibration all need to be done really well at the factory. We have performed a set of detailed Lab spectroradiometer measurements of the tablet displays to see how accurately they reproduce 21 Reference Colors within the sRGB/Rec.709 Color Gamut. The Reference Colors and the colors actually reproduced by the Kindle Fire HDX 8.9 and iPad Air are shown in Figure 2. The Nexus 10 is not shown in the Figure because its small color gamut would result in very large errors within the plot. The color accuracy errors are examined in terms of JNCD (Just Noticeable Color Difference). The Kindle Fire has the best overall accuracy with an Average Error of 2.7 JNCD, which is very good. The iPad Air came in a close second at 3.2 JNCD, and the Nexus 10 came in a distant third with 8.2 JNCD. The peak color accuracy errors are much higher, particularly for the Nexus 10, at 29.4 JNCD. See Figure 2 for a discussion of JNCD and plots of the reference colors and the actually reproduced colors, and the Colors and Intensities section for the numerical results. The screens on almost all tablets and smartphones are mirrors good enough to use for personal grooming. Even in moderate ambient lighting the sharpness and colors can noticeably degrade from light reflected by the screen, especially objects like your face and any bright lighting behind you. Screen reflectance has been steadily decreasing. The Kindle Fire HDX 8.9 has a reflectance of 5.0 percent, the lowest we have yet measured for a full size tablet. Like all previous iPads, the iPad Air still has an air gap between the display and the cover glass, which increases the reflectance from the additional three optical surfaces. The iPad Air has a reflectance of 6.5 percent, which is a significant improvement over previous iPads, but is still 30 percent higher than the Kindle Fire. The Nexus 10 has the highest reflectance of 7.7 percent, which is 54 percent higher than the Kindle Fire. This article has screenshots that show how screen images degrade from reflections in bright ambient light. See the Screen Reflections section for details. While tablets are primarily single viewer devices, the variation in display performance with viewing angle is still very important because single viewers frequently hold the display at a variety of viewing angles, plus they are large enough for sharing the screen with others. All of these Tablets have displays with high performance IPS, PLS or FFS LCD technology, so they were expected to show very little color shift with viewing angle, and our lab measurements confirmed their excellent viewing angle performance, with no visually noticeable color shifts. However, all LCDs, do have a strong decrease in brightness (Luminance) with viewing angle, and the flagship displays all showed, as expected, more than a 50 percent decrease in brightness at a modest 30 degree viewing angle. See the Viewing Angles section for details. What makes the Kindle Fire HDX 8.9 and iPad Air really shine are their very accurate colors, image contrast and picture quality. They are most likely better and more accurate than any display you own (unless it’s a calibrated professional display). In fact with some minor calibration tweaks they both would qualify as studio reference monitors. For proof, see the measurements in the Brightness and Contrast and Colors and Intensities sections, plus the plotted data in Figure 1, Figure 2, and Figure 3. We measured the Power Consumption of all three displays. The relative power efficiency (for the same luminance and screen area) is highest for the Kindle Fire HDX 8.9, which has the highest performance and most efficient LTPS Low Temperature Poly Silicon LCD. Second is the iPad Air, which has a new higher efficiency metal oxide IGZO LCD that is a 57 percent improvement over the previous iPads, which used a-Si amorphous Silicon, but it still needs 30 percent more display power than the LTPS Kindle Fire. Coming in last in Relative Power Efficiency is the Nexus 10 with an a-Si amorphous Silicon backplane that is used in most LCD displays, which requires 73 percent more display power than the LTPS Kindle Fire. See this discussion in our iPad 3 Display Shoot-Out for more information on LTPS, IGZO and a-Si power efficiency. All three of these flagship tablets have the most impressive mobile displays currently available. First, they are all very high resolution, with up to twice the number pixels as your 50 inch HDTV, but on a 9 to 10 inch screen, which is truly impressive. The 2012 Google Nexus 10, which is at the end of its annual product cycle, has a small Color Gamut that is comparable to the older iPad 2, iPad mini, and Microsoft Surface RT, so it has never actually been a good choice when color accuracy is important. Presumably the soon to be introduced 2013 Nexus 10 will take care of that (and we’ll update this article). The Amazon Kindle Fire HDX 8.9 and Apple iPad Air are both even more impressive on another performance level because in addition they deliver top notchpicture quality, absolute color accuracy, and accurate image contrast that is not only much better than any other tablet, they are also much better than most HDTVs, laptops, and monitors. In fact, with some minor calibration tweaks they both would qualify as studio reference monitors. For proof, see the measurements in the Brightness and Contrast and Colors and Intensities sections, plus the plotted data in Figure 1, Figure 2, and Figure 3. Most impressive of all is the Kindle Fire HDX 8.9, which has leapfrogged into the best performing tablet display that we have ever tested, significantly out-performing the iPad Air in Brightness, Screen Reflectance, and high ambient light contrast, plus a first place finish in the very challenging category of Absolute Color Accuracy. None of these display performance accomplishments happened accidentally… The Kindle Fire HDX 8.9 and iPad Air both have impressive display hardware and impressive factory calibration. The Kindle Fire HDX 8.9 has high performance Low Temperature Poly Silicon LTPS LCDs and the iPad Air high performance IGZO Metal Oxide LCDs, significantly better than the a-Si amorphous Silicon LCDs being used in most current displays. Both achieve their excellent picture quality and absolute accuracy through individual detailed factory calibrations of each and every display for both color and intensity scale—truly impressive. This level of display competition and excellence is great to see! Consumers will come to appreciate and then demand this new high level of display performance excellence, which will hopefully spur other manufacturers into improving their display performance in order to remain competitive. All Smartphone and tablets displays can be significantly improved using DisplayMate’s advanced scientific analysis and mathematical display modeling and optimization of the display hardware, factory calibration, and driver parameters. We help manufacturers with expert display procurement, prototype development, and production quality control so they don’t make mistakes similar to those that are exposed in our Display Technology Shoot-Out series. We can also improve the performance of any specified set of display parameters. This article is a lite version of our intensive scientific analysis—before the benefits of our DisplayMate Display Optimization Technology, which can correct or improve all of these issues. If you are a display or product manufacturer and want to significantly improve display performance for a competitive advantage then Contact DisplayMate Technologies. Below we compare the displays on the Amazon Kindle Fire HDX 8.9, the Apple iPad Air, and Google Nexus 10 based on objective Lab measurement data and criteria. For additional background and information see our iPad 3rd Generation Display Shoot-Out and SID Tablet Display Technology Shoot-Out.